Saturday morning’s got a new hot rod TV show and it’s always fun watching since I know Tim and I’ve heard some of what’s going on backstage at the show. One thing I know we’re missing is the details of Tim’s work. If they spun off that show and only showed the building parts, it’d still be a hit. I met Tim through Brian Stupski over at Problem Child Kustoms in Gilbert, AZ or just a few miles down the road from MyRideisMe.com headquarters. 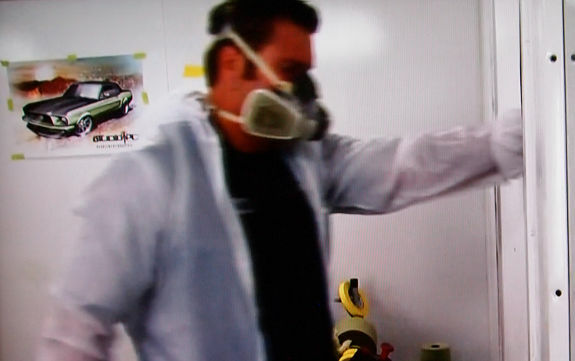 Brian’s hot rod art was featured on the show helping out with a 1967 Ford Mustang. Take one look at the art and you’ll know why this was no gimme for a friend… Brian’s work is top notch. 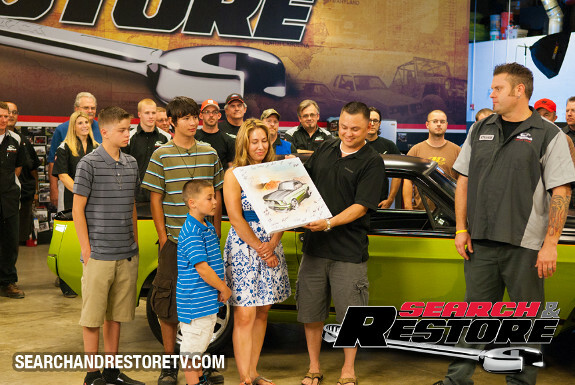 Tim Strange gave a shout some time back, and asked if I’d help out on a Mustang build for his show Search and Restore. I was in, no further questions asked. Paul Kahler made a life-changing decision after the 9/11 tragedy. He enlisted in the US Army. And of all the jobs he qualified for, he made a promise to his 5 year old son to avoid combat duty. So Paul became an Army cook. While serving in the Iraq War, Kahler couldn’t avoid harm’s way. While delivering ice to troops, Paul’s convoy was hit with an RPG. He sustained injuries to his face and neck earning him the Purple Heart. After his discharge, he took a job with the Colorado National Guard, and is furthering his education by taking night courses to get his certificate in family counseling. Tim Strange and the team found Sgt. Kahler to be a perfect candidate to fix up his broken down 1967 Mustang Coupe, reuniting an American hero, with his classic all-American dream car. A chance to honor a man who believed in his country, and left his job and family to serve? Amazing. I sat with Tim, and we threw ideas around and sketched the initial car, working in products from sponsors as they joined… I’ve worked with Tim on a number of projects over the years, and it’s always a blast, but this one, well… it had a different vibe. There was an underlying need for it to be just a bit more special. I threw my guts into it, and we came up with this rendering. Once we had things where we wanted them, I set out to complete the artwork while the build team attacked the manual labor. 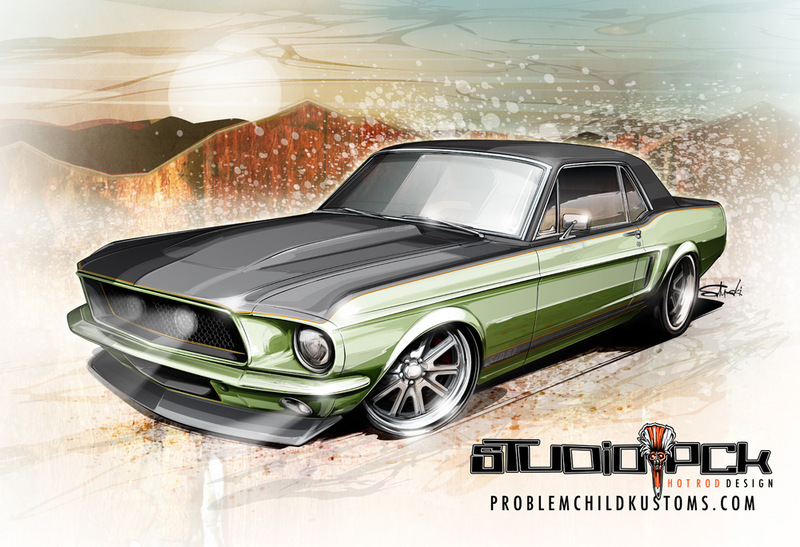 Tim rounded up an all-star team, and these guys poured everything they had into making this one great pony car. HUGE thanks to Tim for the offer to be a part of this, and our respect, thanks and gratitude to Mr. Kahler for his sacrifice and service. Tune in, and give the man a few moments to enjoy the experience of one man receiving something in return for all that he does. 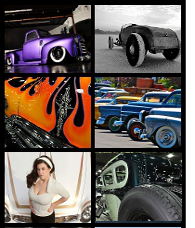 To learn more about Tim Strange hot rod building, go to Strange Motion Rod and Custom and he’s got a “Strange Words” newsletter that covers the shop and a little about the show.